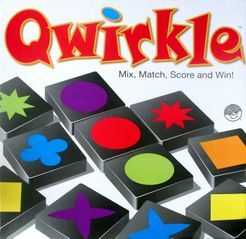 Qwirkle PriceCompare, Buy this board game at the Lowest Price. At first glance, Qwirkle seems like the easiest game in the world to have designed. The rules are so simple and intuitive that you feel this game must have existed for eons as a kind of urgame in the collective unconscious. You’re matching colors, matching shapes—using skills learned in preschool, if not the crib, so you’re not surprised to see the game labeled for players aged 6 and up. Didn’t this game already exist decades ago as a pedagogical tool? Apparently not, but don’t be surprised if you find it in kindergartens and rec rooms everywhere in a few years. *How to play Qwirkl: The box holds 108 chunky black wooden tiles, each with a colored symbol on one face; there are six symbols in six colors, and each of the 36 color/symbol combinations is repeated three times. Players shuffle the tiles face-down, draw six randomly, then take turns placing the tiles in a grid that develops throughout the game. To place tiles, you must choose one or more tiles that all share a color or symbol, then place them in a single line in the grid so that at least one of these tiles is adjacent to an already placed tile with the same color or symbol. (See the image below for examples.) You can’t place a duplicate color or symbol in a row, which means that at most six tiles will make up one line. Once a line of green tiles includes a starburst, for example, then no other starburst can be placed in this line. Tiles needn’t be placed be placed adjacent to one another, but they must be placed in the same line. The rules terminology is a bit awkward because “line” doesn’t mean “entire horizontal or vertical row of tiles and gaps” as you might suspect, but only a linear grouping of up to six tiles that share a characteristic. Thankfully, the examples included clarify the meaning of “line” in the rules. When you place tiles, you score one point for each tile in a line that you created or added to that turn. If you have a row of three red tiles, for instance, and add a red tile with a different symbol, you score four points; if you placed a row of three squares perpendicular to these red tiles, with a red square meeting up with this red row—akin to adding an “S” to a word in Scrabble while forming a new word—you would score seven points: three for the new row of squares and four for the row of red tiles that you enlarged. Placing the sixth tile in a line nets you six points for the line as well as six bonus points, which means that opponents need to be wary of placing the fifth or even the fourth tile in a line since the average points per turn is far below the 12 scored from a complete line. Due to the placement restrictions—matching colors or shapes, but not having repeated colors or shapes—you can cut off rows that threaten to max out by boxing them in with other rows. Instead of placing tiles on a turn, a player can choose to hand in some or all of her tiles and draw new ones, mixing the discarded tiles back into the reserves. This move is typically one of sheer desperation or blind hope, with the player hoping for a tile that will let her complete a line, but scoring 12 on a subsequent turn is rarely worth forfeiting your ability to score anything this turn. Still, the move can pay off depending on the board situation. Tiles in the grid are visible, so you can track which tiles remain to be played and plan your moves accordingly. Initially, the game seems to be determined by luck, that is, whoever draws tiles that complete a line or add to multiple lines will win. After a few games, though, you learn how to play defensively, cutting off opportunities to complete a line by sandwiching the ends of an open line with off-color or off-symbol tiles that render spaces unplayable. You pay more attention to the order in which you place tiles to create opportunities for future plays. You leave a symbol or color dangling open on a line to lure an opponent into adding to it, thereby setting you up for a future play. *Endgame Managing the endgame also becomes clearer with repeated play. Once the reserve of tiles runs out, players keep taking turns until someone plays her final tile. This player scores six bonus points, then the player with the highest score wins. In my first game or two, I played the end the same as the beginning—laying out whichever tiles scored the most points each turn—but with experience I’ve changed my approach to turns from start to finish. I pay more attention each turn to what I can set up for myself in future turns and play more defense. Moreover, I might sacrifice a point or two if I can play more tiles and therefore increase my odds of drawing a tile I really need. As for the endgame, you ideally want the player to your right to take the last tiles in the reserve as that increases your odds of going out first. You might even keep pairs or triplets of matching tiles in reserve as the endgame nears so that you can rocket out quickly and grab those final bonus points. *Conclussion Qwirkle resembles Ingenious/Einfach Genial, both in looks and game play, but the similarities should be seen in a positive light rather than a reason to dismiss this new game as more of the same. Just as my playing style in Ingenious has advanced through multiple stages—from making big pools of color to playing defense against opponents to sabotaging a color to monopolize it—I can see the same progression already taking place with Qwirkle. You can make skillful plays if you know what to look for. That said, players can approach the game with different frames of mind and still have a fun time. You can play semi-cooperatively with family members young and old, not worrying about the risk of someone else completing a line, or you can be more cutthroat and think through each play. Luck will still play a role in determining who wins; drawing duplicate tiles or drawing a tile that you just played (which feels even worse than a duplicate) can hamper your play possibilities. This mix of luck and skill, along with the easy-to-learn rules and clear examples of play, creates a fabulous abstract game that should win over almost anyone who plays games.